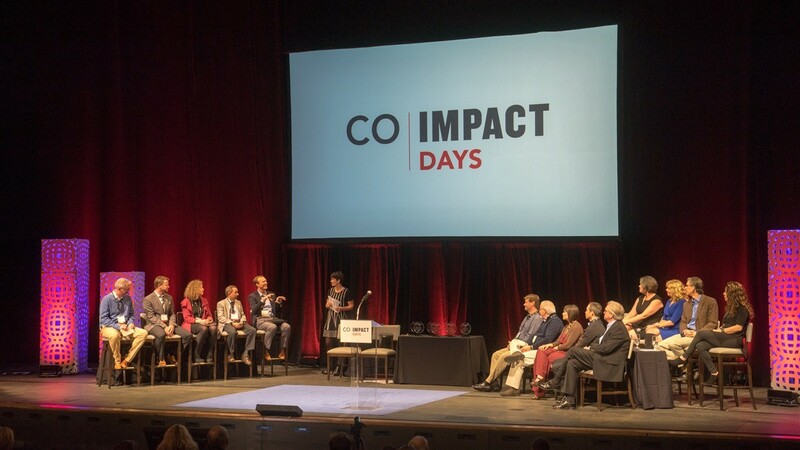 CSMlearn participated in the Social Ventures Marketplace at CO Impact Days, a leading conference for connecting social businesses to investors who are looking for a "double bottom line" of social impact as well as traditional financial returns. Impact investing is in between the poles of philanthropy (only interested in social benefit) and traditional investment (only interested in financial returns). Interest in impact investing is building along with the movement towards B Corps and public benefit corporations. All are united by the ideal that it is not at odds to be both a for-profit company and concerned with your impact and benefits to society. We at CSMlearn fully agree! Click here to learn more about CO Impact Days. Introducing our new High Performance Communities website! Our High Performance Communities initiative now has its own website, www.highperformance.community, where you can learn about the vision, the process, and the benefits. The High Performance Communities model is a fresh approach to transforming education and the workforce across entire communities – empowering individuals to reach their full potential, providing a world-class workforce to existing and new businesses, and uniting the community with common purpose and possibility. Please take a look, share it with colleagues, and contact us if you'd like to be a Spark for your community! We have converted CSMlearn into a Public Benefit Corporation so that our legal form is now authentic to who we are as a company! Public Benefit Corporations are a new form of legal incorporation that allows for companies to make decisions for the benefit of all of their stakeholders, not just their shareholders. Our aim is to create broad scale social changes, and while we are a for-profit company, we want to make choices that will benefit the world, not just ourselves. The Articles of Incorporation of a Public Benefit Corporation require a purpose that the company is bound to. After much deliberation, we came to the statement below. To empower people around the world to reach their full potential in their education, in their careers, and in their lives -- being particularly mindful of those who are underserved. Through the business and operations of CSMlearn, to benefit its stakeholders taken as a whole, who include owners; employees; users of its services and products; business partners and suppliers; the local communities in which it operates; and its home, the earth. The Evaluating Digital Learning for Adult Basic Literacy and Numeracy study, funded by the Joyce Foundation and evaluated by SRI Education, evaluated the efficacy of five technologies in adult education: CSM, Reading Horizons Elevate (Reading Horizons), My Foundations Lab (Pearson), ALEKS (McGraw Hill), and GED Academy (Essential Education). Of the five evaluated products, only CSM had significant positive impact on math scores, and CSM also had the highest improvement in literacy scores. CSM also had the highest engagement. We're proud to report that CSMlearn is the recipient of a 2017 Community Champions Award from Cuyahoga Community College for making a difference in the lives and career paths of Tri-C students! 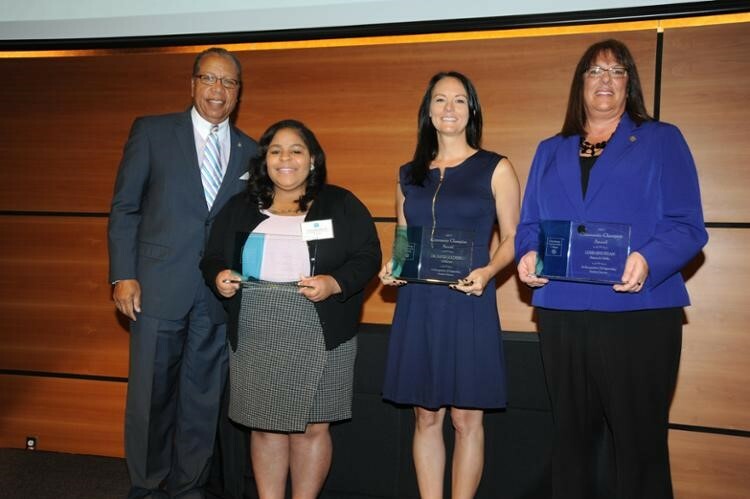 Expert Coach Jessica Hartman (third from left in the blue dress) flew to Cleveland to receive the award from Tri-C President Alex Johnson (far left). Assistant Dean Vincent L. Briley writes, “We have enrolled over 300 ADP candidates in CSMlearn who have collectively spent over 30,000 hours to improve their reading comprehension, mental mathematics, and computer literacy. More importantly, CSMlearn has provided an elegant mix of online adaptive learning experiences to improve the self-directed learning of our ADP candidates, who are re-engaging their academic promise to meet their career and college readiness goals." Proud to be B Corp! CSMlearn is now a Certified B Corporation® -- which means that we have passed a rigorous assessment to ensure that we meet the highest standards of “verified social and environmental performance, public transparency, and legal accountability”. We join 2140 companies in 50 countries and 130 industries who are trying to make the world a better place by incorporating social impact business best-practices. Our goal is for the CSM Course and Certificate to provide a meaningful path to opportunity for a billion people worldwide. We want to be a force of system change, individual transformation, and community building, and being a B Corp helps keep us focused on that goal. Click here to view CSMlearn's Impact Report. CSMlearn is having a positive impact on adult education, and a consortium of education researchers presented about it at the 2017 Coalition on Adult Basic Education (COABE) National Conference in Orlando, Florida. Patti Constantakis (Digital Promise), Robert Murphy (SRI International) and Shannon Sims (Mockingbird Education) shared the initial results from the Technologies in Adult Basic Literacies Evaluation (TABLE) Study in their session "Do Digital Learning Technologies Support Literacy and Math Skill Development for Low-Skilled Adults?" 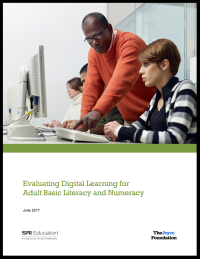 The TABLE Study examines the implications of technology in adult education by analyzing the effects of five digital adult literacy instructional systems, including CSM, My Foundations Lab (Pearson Education) and ALEKS (McGraw-Hill Education). CSM had the largest gains in both math and literacy, and the highest student engagement. Vincent Briley, JaNice Marshall, and Victoria Berry (Tri-C Community College) presented on "Mission-Driven Innovation: The Adult Diploma Program at Cuyahoga Community College 2015–2017", highlighting how CSM is helping adult diploma candidates build the skills, persistence, and self-efficacy that they need to pass the WorkKeys Assessments and succeed in career pathways courses in Tri-C's innovative new approach to earning a high school diploma. In addition, 5 CSM-Certified students were runners up for the Adult Learner of the Year Award. Our congratulations to Brian Russell, Andrea Vulgamore, Jamar Cameron, Patience Eutz, and Rhonda Worley! CEO David Goldberg presented at both the Texas Economic Development Council (TEDC) Annual Meeting in San Antonio, TX, and the California Association of Local Economic Development(CALED) Annual Meeting in San Diego, CA, to introduce the economic development community to the concept of High Performance Communities. While economic development traditionally focuses on business incentives, the strength of a community is based on the strength of its workforce. Economic developers often have deep ties to government and to the broader business community and are well-positioned to be the initiators of a High Performance Community (and will be especially excited to see new businesses attracted by the newly world-class workforce that a High Performance Community provides!). App-arently CSM users love using their phones! You asked for a more mobile-friendly way to work on CSM, and you wanted to be able to continue building your High Performance skills when you are on the go. When you make suggestions, we listen! The CSM Android app is fully featured, and offers a much more streamlined interface (internet access still required). 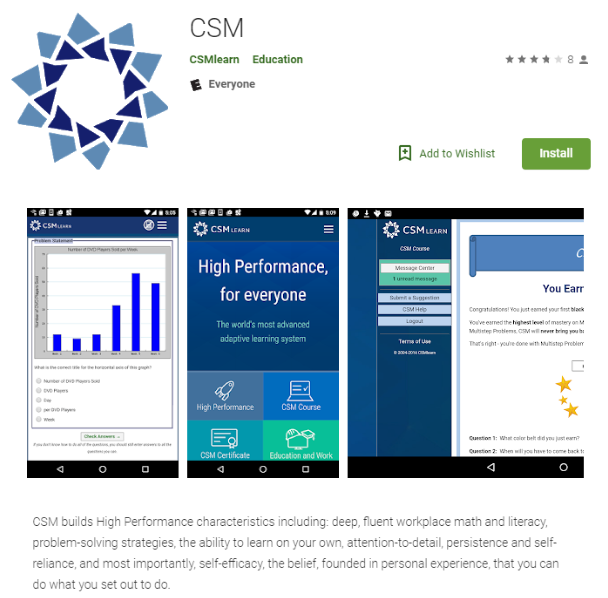 To get the CSM app, go to the Google Play store on your Android device and search for CSMlearn, or click Download Now.